My summer research project involved extensive use of Macaulay2, a computer algebra program. Essentially, what Macaulay2 does is make it easy to do computations on different types of abstract algebra objects, like rings and ideals. Since there is no native version of Macaulay2 for Windows, my options for running it these past two summers have been: run it in Windows under Cygwin or, once again, dual boot Windows and Ubuntu (or Kubuntu). Ubuntu and I have a love/hate relationship, as I have testified on this blog before. It’s been a while since I last blogged about my adventures with Linux, and now it’s time for an update. I have rewritten my “About Me” page. It has needed some updates for a while now. I focused on making the page briefer while keeping it informative. Now people who come to my site can know who I am in a few paragraphs. If they need to know me more deeply, they will know where to stalk me. Also, the page now includes an excellent photo that portrays my love of math and silliness. The photo comes from back in May. Our mathematics resource room received new carpet, so Aaron, Rachael, Tim, and I were drafted to remove all the books from the room and store them in our office until the carpet was replaced. Then we reshelved all of the books, and posed for some silly photos. I've long wanted to put a photo of myself on that page, but until now I didn’t have any that seemed adequate. I was browsing my Flickr feed in the hope of finding something suitable when this gem appeared; the moment I saw it, I yelled, “Yes!” and laughed maniacally. This morning, we had two cats. Their names were Marble and Kaylee; they were sisters. I don't remember exactly when we got them, for I was very young, but they must have been 12 years old or even older. 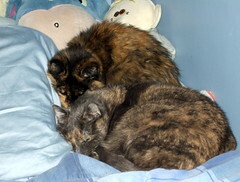 So they have been around for most of my life now, and I have grown accustomed to their curmudgeonly feline ways. Upon moving into our newest residence in 2007, Marble took up the habit of sleeping on my bed, while Kaylee appropriated my new reading chair for herself. These arrangements continued for another three and a half years. As of this afternoon, we have one cat. Marble died sometime around two o'clock, by my reckoning. I am sorry to see her go, but she was old and ill, and I suppose it was her time. Last Friday marked the end of my summer research term. For reasons I don't entirely understand and don't need to understand, Jessica made a pie to celebrate the milestone. It was raspberry (my favourite fruit) and, more importantly, it was delicious. This summer feels like it has gone by extremely quickly, and I'm not yet eagerly anticipating school. I have two weeks off now, returning early on August 29 to begin the intense final year of my concurrent education degree. My schedule does not seem all that bad, as far as classes go, but I'm not sure what the workload will be like—I hear it's heavy but not difficult. Yesterday was the deadline for voting in the Hugo Awards. I submitted my final ballot on Friday. I managed to finish all of the Hugo-nominated works in the novel, novella, novelette, and short story categories. I also voted in the best related work and best dramatic presentation categories, and I voted for the John W. Campbell Award for Best New Writer. Here's an overview of my picks for this year's Hugos. The Dervish House , by Ian McDonald. This did not blow me away, yet it somehow stuck with me and persuaded me to give it five stars. I hope it wins.